Erwin Wurm, Stand quiet and look out over the Mediterranean Sea, 2017. 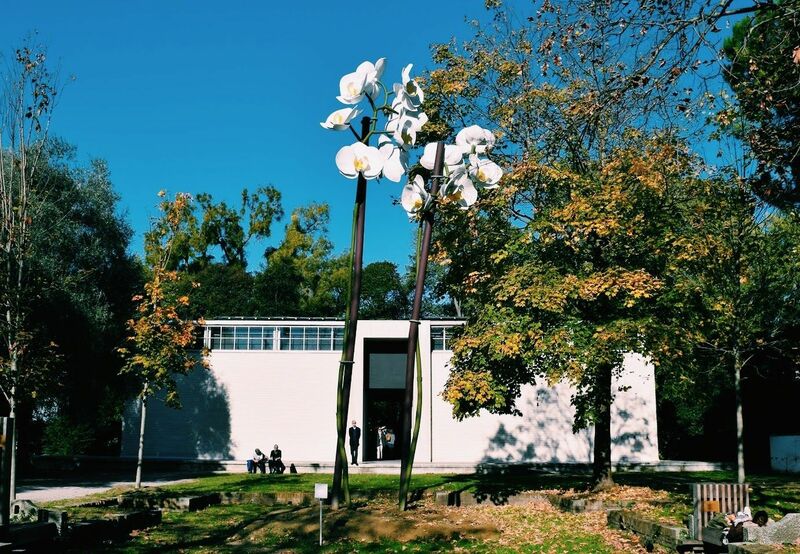 At the last Venice Biennale, in 2015, Isa Genzken installed some very beautiful, towering orchids at the far edge of the Giardini, and I remember looking at them longingly, wishing it was possible to climb up their stems to enjoy the view from their petals. One biennial later, those vistas have been pretty much delivered—by Erwin Wurm. A short walk from where Genzken had installed her pieces, the artist has plopped down a huge truck on its front as part of a two-person show in the Austrian pavilion (with Brigitte Kowanz), and you can climb up steps hidden inside it to have a nice look at the park. It’s no Genzken, but it’s a harmless little folly, and it offers a welcome respite from walking through white-wall galleries. The work is part of Wurm’s “One Minute Sculptures” series, which typically asks viewers to do something a little goofy or embarrassing, like stand on a platform with cartons of milk on their feet. Here, though, Wurm’s instructions (which also serve as the title of the new piece) are low-key. A little sign at the top—which is to say, the back of the truck—says, “Stand quiet and look out over the Mediterranean Sea.” Nothing simpler.